from the archive, just in time for the holiday. Among the many traditions associated with the quickly-approaching Jewish holiday of Purim, perhaps the most widely-kept one is the consuming of copious amounts of alcohol hamentaschen. Are you surprised that it's my favorite holiday in the calendar? Fashioned after Haman's pocket, hamentaschen are cookies filled with anything from poppyseed to raspberry jam to Nutella, and folded up to resemble a triangle. They're not too sweet, flavored with vanilla and lemon zest, and perfectly crunchy outside while soft within. Everyone has a favorite filling, and mine -- poppyseed -- is, unfortunately, hated by many folks. I appeased the masses this year by making a large batch of raspberry-chocolate filled ones. I'll save the poppyseed for myself. I also scored a tub of halvah (sweet sesame paste), so that should make for some interesting cookies as well. The number of hamentaschen recipes I've tasted reaches the teens. From the ones in Israel (which are non-dairy, and inevitably made with way too much scary margarine) to three of my mom's recipes, to countless others we receive from friends each year, I settled on my uncontested favorite long ago. 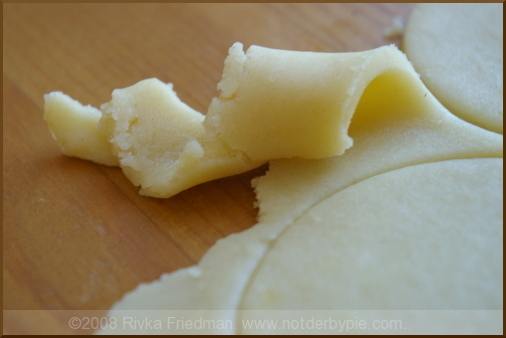 That recipe, which I've posted here, is what I have used to make hamentaschen for four years running. While other recipes may be easier to work with, they produce a cookie that's neither crunchy nor chewy, but merely soft and unpleasant to bite. They come out more cake-y than cookies ever should, and less flavorful as well. The recipe I post here requires a fair amount of patience, but the resulting hamentaschen make up for the (minimal) hassle. You'll see. By now, many of you have emailed me asking for the recipe, so without further ado, here it is. I made my two batches on Sunday, and they came out delightfully crispy and cookie-like, just as I love them. Please note that if you need to make twice or three times as much as the recipe produces, make the batches one at a time; this recipe does not like to be doubled. Add egg and extract/zest, and mix about 1 minute more. Add dry ingredients to wet and mix on low to combine. Add up to one more cup of flour, just enough that the dough comes together and does not feel sticky. Gather dough into plastic wrap or wax paper, and refrigerate 30-45 minutes (much longer, and it'll be tough to work with). 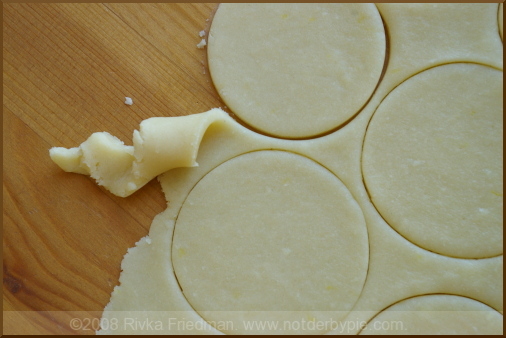 Using a 2-inch cookie cutter, slice cookies out of the dough. Lift each circle off the table to ensure that it doesn't stick. Wet the rim of the circle with a bit of water, and bring up the sides to form a triangle (as pictured). 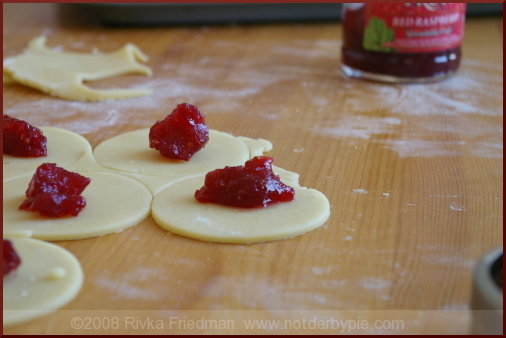 Place on a baking sheet with 1/2-1 inch room in between hamentaschen. 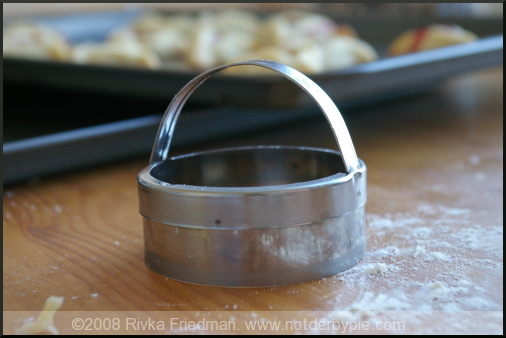 Bake for 10-16 minutes at 375 degrees, until the tips of the triangles are golden. Store in between layers of wax paper in an airtight container.